I think they’re neat, myself. And most of the topics I cover will end up being A (Black) Gat in the Hand posts. Friend me on FB and see what I’ve been writing about. Well, I started collecting all those posts and discovered that I’ve already done enough for at least two Black Gate essays. So, here’s the first. It’s very informal, and it doesn’t read like a normal post: think of it like an anthology of short stories. There’s no continual narrative – But there’s some good pulp info! I made very minimal changes and most read exactly as the original FB post did. 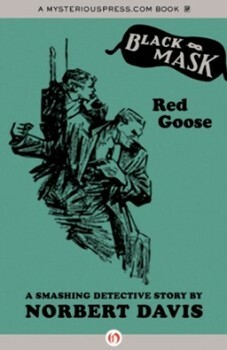 Today’s Back Deck Pulp is Norbert Davis’ “Red Goose,” the first of his two Black Mask stories featuring PI Ben Shaley. When Raymond Chandler began writing for the pulps, he said that “Red Goose” impressed him more than any other tale he had read. Years later, he said he had not forgotten it. Davis received a law degree from Stanford, but by then was selling so well to the pulps, he never took the bar exam. As you can see, Byrne House went digital today. You can read this one for free with Kindle Unlimited. There’s a lot packed into this short story. I like it. Wish he’d written more with Staley. Davis was the subject of the June 25th A (Black) Gat in the Hand. ‘Roger Torrey broke into the pulps with the January, 1933 issue of Black Mask and quickly became a Shaw favorite, appearing eight times that year, with “Blackmail is an Ugly Word” being one of seven stories about policeman Dal Prentice. Even among pulpsters, Torrey was a heavy drinker and fell out of favor with editors around 1940. 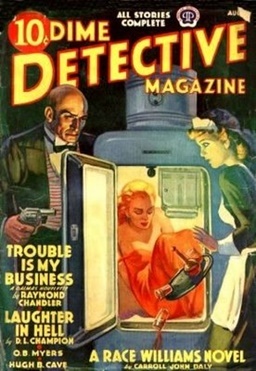 He spent his last several years writing for the ‘lesser’ detective pulps until he died of alcohol-related causes in 1946. He was only 45 years old. Torrey is largely forgotten today but he wrote fast-paced hardboiled yarns; often with Irish protagonists. In just over a dozen years of writing, he turned out nearly 300 stories and one novel – 42 Days for Murder (available as an ebook for only $1.49). 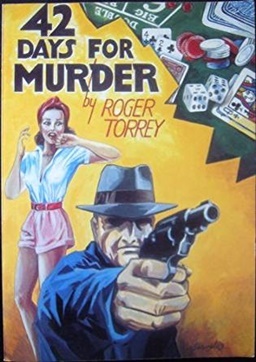 If you like true hardboiled style pulp, you should give Torrey a chance. It’s a bit wet outside, so no Back Deck Pulp this morning. Instead of reading, it’s writing! I did finish the Norbert Davis/Ben Staley piece last night. More Davis coming. With editorial comments from me. I think it’s an interesting piece. Shaw probably commanded more respect as a pulp editor than anybody else of that era. Shaw was given the boot from Black Mask in 1936 and became an agent. 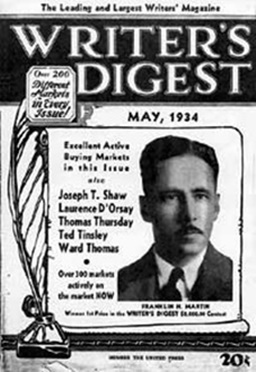 Several prominent writers left the magazine after Shaw was fired. 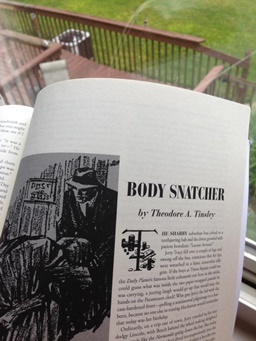 If you like the old hardboiled pulps, you really should check out my Monday morning column over at BlackGate.com. I’m pretty sure you’ll find something you like. Post #3, tomorrow, will look at some of the anthologies I’m culling for stories. 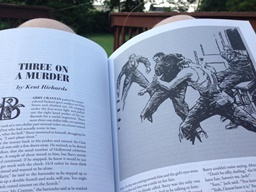 And because I can’t resist talking about my two favorite writers, not only will there be a post about John D. MacDonald (#1), I’ll also do one on Robert E. Howard’s hardboiled PI, Steve Harrison. Essay #3 of With a (Black) Gat goes up over at BlackGate.com later this morning (covering hardboiled anthologies). I’ve already written over a half-dozen future posts, striking while the iron is hot, as it were. The column is still trying to find its footing, though I think it’s coming along. A feature that will be appearing regularly is a look at the contents of an issue of a pulp magazine (usually with a cool cover!) There will be a paragraph or two about each author in that issue plus a little info about the magazine itself. The impetus for this series was to share my love of hardboiled pulp writers. Highlighting specific issues – be they from Black Mask, Dime Detective, Detective Fiction Weekly, et al, is going to let me talk about a lot of different pulpsters. I know little or nothing about several of these subjects (no surprise there, eh? ), so I’m learning along with you. I’ve already become a big fan of W.T. Ballard’s Bill Lennox through With a (Black) Gat and I now appreciate Raoul Whitfield’s MARVELOUS Jo Gar tales. I had encountered a couple stories about the Filipino detective before, but they didn’t really register. They sure have this now! I’ve written up a couple Black Mask issues and this morning I’m working on the August, 1939 Dime Detective, which was last week’s post. Raymond Chandler, Carroll John Daly, Hugh B. Cave and D.L. Champion for ten cents. That’s a deal! It went live on July 9th. Rain has moved Back Deck Pulp indoors. Theodore A. Tinsley created the most popular female character in the pulps: Carrie Cashin. It’s a Sunday night bonus Back Deck Pulp. With a (Black) Gat will, of course, talk about my favorite Hardboiled pulpster. More than once! Too nice outside tonight to not have another Back Deck Pulp. After the success of The Maltese Falcon serial in Black Mask, editor Joseph Shaw encouraged Dashiell Hammett to write more Sam Spade stories. Not only did Hammett refuse, he would leave Black Mask by the end of the year. However, he would pen three more Spade stories a few years later. I thought only one of the three somewhat memorable. 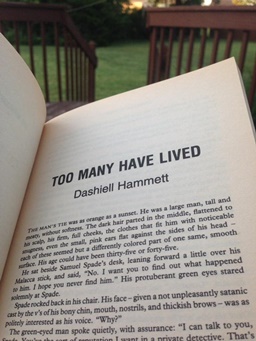 “Too Many Have Lived” appeared in American Magazine and I consider it the second-best of the three. A Friday night Back Deck Pulp. T. T. Flynn appeared in a LOT of Dime Detective issues, but I need to do some research on him before he can feature in a With a (Black) Gat post. 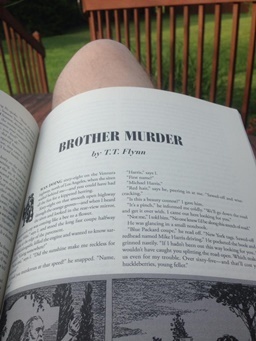 “Brother Murder” appeared in the December 2, 1939 Detective Fiction Weekly and was included in the Spring, 2017 Black Mask. Flynn appeared in Dime Detective 80 times – more than any other author (7 more than Frederick C. Davis). His 35 Mr. Maddox stories were second only to Frederick Nebel’s Cardigan tales (Nebel was the star of the fourth post in this series). Altus Press (which is continually putting out great old stuff) has released the Maddox stories in two volumes. Here’s the first one. And a Flynn story or two has been included in the new Black Mask magazine. It’s a Bonus Back Deck Pulp tonight! “Three on a Murder,” originally from the June, 1941 Double Detective, was also reprinted in the Fall, 2017 Black Mask (see my last post on Hugh B. Cave). I don’t know anything about writer Kent Richards, but I like Barry Cranston and his one-man Hollywood private detective agency, Confidential, Inc..
Ok – I now know that Kent Richards was one of several pseudonyms for Kendell Foster Crossen, who was pretty active in the ‘lesser’ mystery pulps in the early forties. He wrote The Green Lama stories as Richard Foster. In fact, he had a Lama story in this same issue of Double Detective. And if you’re thinking the title is a play on the old wive’s tale, ‘Three on a Match’ (also a Bette Davis movie with Humphrey Bogart), you’re right: they pay it off at the very end. I’ve already got enough stuff for a second Back Deck Pulp post and I’m adding more BDPs weekly on FB. Bob Byrne’s A (Black) Gat in the Hand appears weekly every Monday morning at Black Gate. Hey R.K. – I figure you’ll do your weekly check in. Which I appreciate! Since you said you don’t FB, can you throw me an email at upabob@yahoo.com ?